My sister-in-law posted a video on Facebook recently in which the oldest member of our family, my mother, soon to be 90 years old, is walking down the hall of her residence with a walker. In front of her, pushing a bright, primary-colored walker, is her great-grandson, soon to be 1 year old, babbling and cooing as he looks back at his great-grandmother. The picture envelops the generations of family and captures the beginning and the end of the stages of human life. Every stage is precious; every stage a sign of our love for one another and of God’s love for us. My now elderly mother was born in a prairie farmhouse in Saskatchewan in 1926, prematurely and not expected to live; but her mother, her aunts and her older sisters did their best to keep her alive and thriving. Life is so ordinary and so precarious, yet families accept the risks and dangers as the love of family transcends these existential threats. It is not only mothers and fathers who choose life, though, but most significantly God. Infertility was a mark of shame in many ancient cultures; and Hannah, Samuel’s mother, was unable to have a child. Finally, Hannah’s prayers were answered when she became pregnant and gave birth to Samuel. She saw her son Samuel as a gift from God, as truly every child is, and offered him back to God after he was weaned. Though most of us could not make Hannah’s decision to offer her young son fully to God’s service at so young an age, all of us are intended to serve God. For we not only belong to our families here on earth; we belong to God’s family. We see this in Hannah’s dedication of Samuel to God’s service in the Temple, and we see it in Jesus’ own recognition that the Temple in Jerusalem was his true home. But Jesus’ call to serve God and his recognition that he was indeed the Messiah, the Son of God, took place within the context of his earthly family. The only story of Jesus’ boyhood in the canonical Gospels, Lk 2:41–52, places the boy Jesus in the midst of an extended kinship network: “Assuming that he was in the group of travelers, they went a day’s journey. Then they started to look for him among their relatives and friends.” His parents do not seem overly worried initially about the fact Jesus is missing, because they would expect him to be among their extended family of relatives and neighbors, including perhaps elderly grandmothers and wobbling toddlers. Joseph and Mary are ultimately filled with anxiety (Lk 2:48), as any parents would be; and when they find their child, they ask him, “Why have you done this to us?” Jesus replies, “Why were you searching for me? Did you not know that I must be in my Father’s house?” Jesus calls the attention of his earthly family to the precedence of God the Father in his life. Jesus’ response points to the priority of God the Father over human family in general. A tension persists, even though Jesus has been found. The lost child was truly at home with God. As much as he is a child of Mary and Joseph, he is even more a child of God—in his case, the Son of God. As the First Letter of John tells us, though, we are all children of God, and all of us are intended for life with God the Father. Christianity, following Judaism, did refocus the understanding of family to recognize the true family, which ultimately encompasses all of humanity and sees the true Father as God. Still, Jesus, like all of us, had responsibilities to the family and a place in the earthly family, as do 1-year-olds, 90-year-olds and everyone in between. 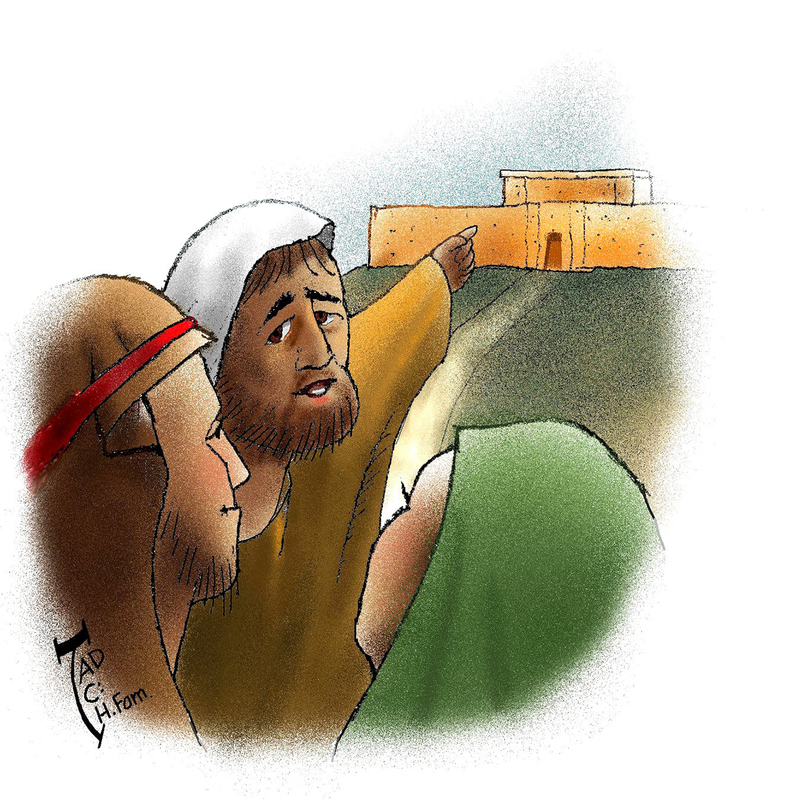 Luke’s account ends with Jesus acknowledging his earthly parents’ authority, and Luke states that Jesus was obedient, or subject to them following his adventure. The way we come to know our heavenly family and heavenly call is through our parents, our extended families, those who raised us, who in encompassing us with love draw us nearer and nearer to God and our home with God. To complain for what this column was not about (the second coming) or that it wasn't strictly about kingship, may be to miss the point of this Gospel reflection? In Martens' "The Family of God", I especially liked this sentence, "Life is so ordinary and so precarious, yet families accept the risks and dangers as the love of family transcends these existential threats." How much more so did the Holy Family accept risks and dangers! I also like the description of the young and old in Martens' family leading to a fuller image of the persons in the caravan, the people in Jesus' life just as the beloved young and old in our own human connections. Martens reminds us this is the only boyhood story in the canonical Gospels we have of Jesus. We learn of Jesus even as a boy, firmly telling everyone where He truly belongs. And many times in his life, He will do so. But here, Jesus -- so remarkably -- put himself again in obedience to Mary and Joseph. How very many times (that we do not have written about) Jesus must have mildly laid his glory by for us. This article also appeared in print, under the headline "The Family of God ," in the December 21-28, 2015 issue.